It’s chocolate this time, which is maybe the first ever on the site, at least made with classic ingredients. You can find my previous chocolate forays into cakes with “alternative ingredients” here and here. Though, I suppose if we expand our definition of cake to whoopie pies and donuts, then I have more examples. Hmm. My point really, is this is my first chocolate layer cake for Tea and Fog, and I am very excited for it! 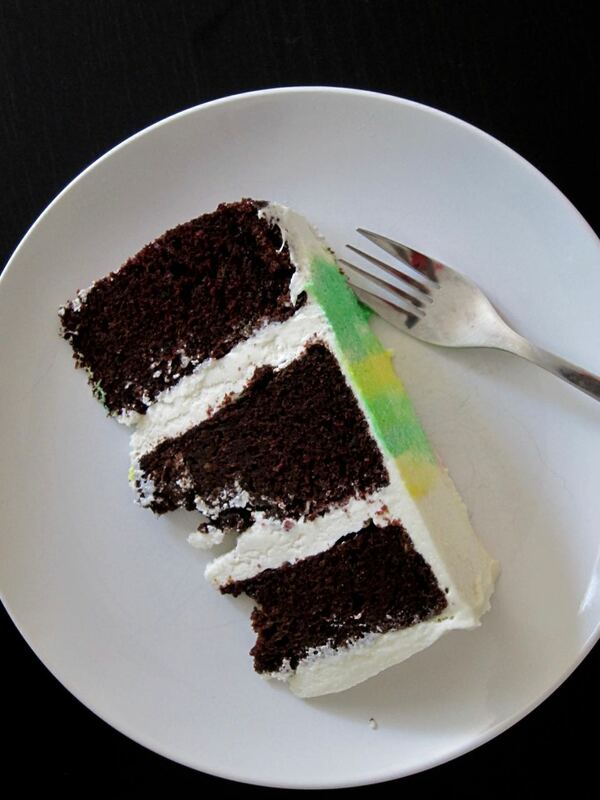 But you know I had to go and throw something weird in there, and this time I tossed some zucchini into my cake! It might sound odd, though I think you’ll thank me when you realize I’m helping you wade through your late summer produce surpluses. Are you maybe drowning in zucchini but can’t stomach eating much more of it? Well, here is your answer. You can hide it in dessert! You won't even notice. It’s not really that weird if you think about it, because zucchini bread is a real thing and is delicious, and I’m certainly not the first person to pair chocolate and zucchini, though I mostly see the combo popping up in muffins. But a quick search for a recipe led me to several tried and tested options, so I didn’t even have to come up with my own cake recipe for this one. Easy breezy summer treatsy. Where I really got into trouble with this cake was with the frosting. I opted for a cream cheese frosting, because in my book that is the only acceptable answer for vegetable cakes (you monsters frosting carrot cake in regular buttercream can keep walking). What I did not bargain on was my little local store being entirely out of cream cheese. I decided to sub with a little mascarpone, which made me feel brilliant until I actually mixed it up with a block of cream cheese and some butter. Honestly I’m not sure what happened, other than comments I found online that mascarpone is tricky to work with. I’ve used it before in a stabilized whipped cream, but it seems it may be too fragile to hold up to beating into a buttercream, or at least I never uncovered the trick to it. But after a full day nursing my frosting to a usable consistency with the aid of my hair dryer and my roommate's ice packs, only to have the smooth frosting curdle upon contact with my cake, I just decided to go with it, because $$$. The end result was pretty, and most people probably wouldn’t balk at the frosting, just obsessives like me. The flavors are incredible together, the rich, moist chocolate cake pairing well with the creamy frosting, tempered by the tartness of the cream cheese. And, oh yeah, some pink peppercorns, because I just can’t help myself. Make the cake layers: Heat oven to 350 degrees, and grease and line with parchment three 6-inch cake pans (or two 9-inch pans). Whisk together flour, cocoa powder, baking soda, baking powder, and salt, sifting all together if flour or cocoa seem clumpy. In the bowl of a stand mixer, combine oil, sugars, eggs, sour cream, and vanilla and beat on medium speed until well-combined. Add in the dry ingredients and gently stir to combine fully, scraping down sides of bowl as needed. Gently blot the shredded zucchini with paper towels and then fold into the batter. Divide between prepared baking pans and bake 25-30 minutes until a toothpick inserted in the center of one of the layers comes out clean. Remove pans to cooling rack and cool completely in pans. While cake layers are cooling, make the frosting: beat the cream cheese and butter together on medium-high speed, and sift in the powdered sugar and salt and continue beating until smooth. Add 2 cups of sugar to start, and then up to 1/2 cup more if desired for sweetness. Add in the vanilla and beat to combine. Set aside 1 1/2 cups frosting in a separate bowl and stir in the peppercorns. 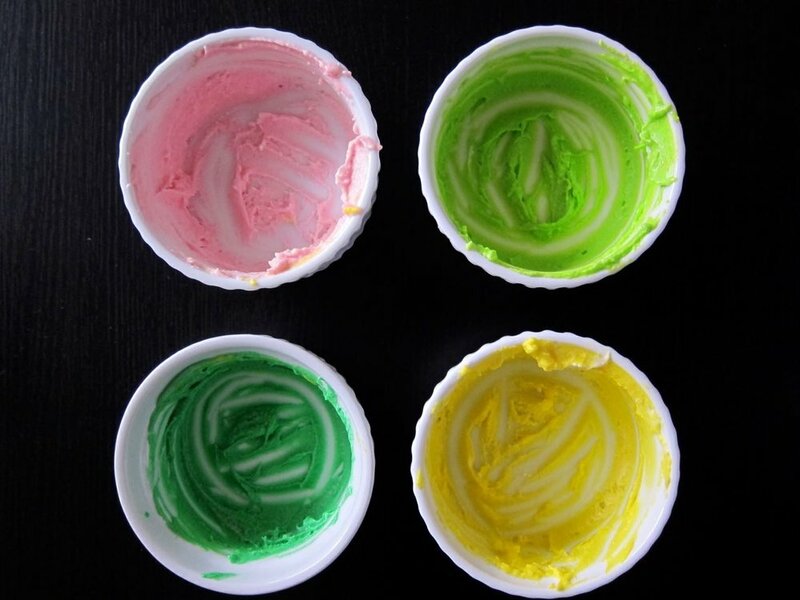 At this point, set aside another 1/2 cup frosting to dye various greens and yellow and pink if you want to add the watercolor effect I used on my cake. Assemble the cake: Trip the tops of the cake layers to even them. On a cake board or plate, top the first layer with half of the peppercorn frosting and spread evenly, then top with the second layer. Repeat with remaining peppercorn frosting and top with third layer. If the frosting squishes out too much at this point (the cake layers are heavy!) you can chill the frosting topped layer for a few minutes in the fridge to harden before stacking on another layer. Spread the entire cake with a thin crumb coat of plain frosting and then chill for 45 minutes. Once crumb coat has set, continue icing with remaining frosting. To add watercolor effect: using a small icing spatula or butterknife, dollop on the dyed frostings around the cake as desired, then smooth sides with a bench scraper or larger spatula to create the watercolor look. 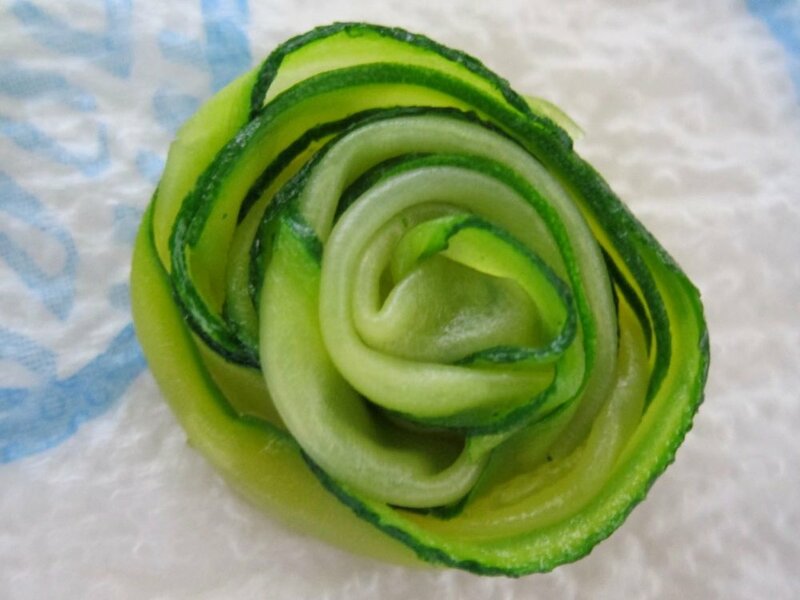 To decorate with zucchini roses, see recipe below, but this part is entirely optional. Bring water, sugar and salt to a boil in a small pot. Simmer the zucchini strips for 30 seconds each, then remove with tongs from the syrup, shaking gently to drip off excess. Lay on paper-towel lined surface and let cool a bit. When strips are cool enough to handle, twist and roll strips into rose shapes, or as close to rose-ish shapes as you can get. Let cool, then adorn cake as desired.